The NFAV230-C1 Audio Stand (Cherry) from Sanus has four shelves for holding all of your components. 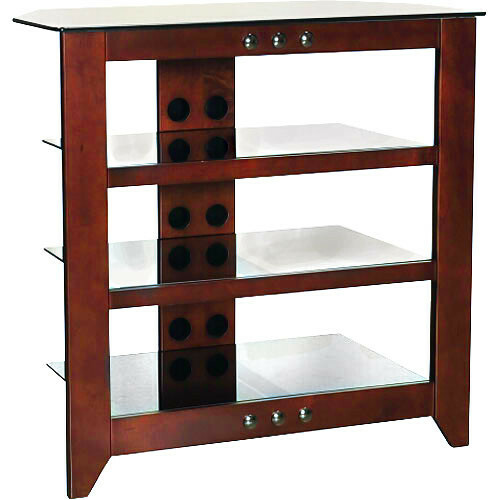 This hardwood stand features adjustable tempered glass shelves and a concealed wire management system. This unit has angled rear corners for positioning in corners. Box Dimensions (LxWxH) 31.0 x 30.0 x 5.5"
NFAV230-C1 Audio Stand (Cherry) is rated 4.0 out of 5 by 3. Rated 2 out of 5 by Anonymous from Very unstable !!!! The only good thing about it is the looks. It is very unstable. It rocks back and forth without much effort and I put the heaviest devices, a receiver, on the bottom shelf. The other shelves have a very light Oppo DVD player and a Dish receiver. Absolutely impossible to put any TV on the very top. I will have to figure out some kind of cross braces to strengthen it. I own another 10 year old Sanus A/v stand which has wood cross braces and it is rock solid. This one is so cheaply made and cannot tighten down the tubes otherwise they strip. Would not recommend to anyone. A disaster waiting to happen !!!! Rated 5 out of 5 by Rayray from TOP NOTCH Excellent product, quality is second to none! The only drawback is the height of the shelvings are on the small side. I have an Onkyo 806 and it wont fit. I had to put it on the top shelf and it looks great. Cable management system works great. Rated 5 out of 5 by Anonymous from easy to set up quality product; easy to assemble.